ExpandoThane is used as a Polyurea Roof Coating, Polyurea WaterProofing and any areas needing a high build Polyurea Coating. ExpandoThane is a VOC free Plural component Polyurea with micro blowing agents to create a hard skin polyurea that expands five to seven times its volume to span gaps and fill bug holes. ExpandoThane Polyurea Roof Coating sprays a light green color. By nature the geen changes to a yellow color with a slight gloss. When applying ExpandoThane Polyurea as a flat roof seamless system you can give your customer cost savings by leaving it this color should he elect we have a single component Aliphatic Polyurea in White. 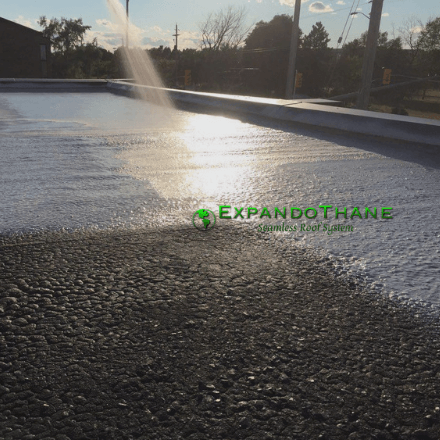 ExpandoThane Polyurea may be applied as a secondary roof covering over Metal Roofs, Modified Bitumen Roofs, BUR, Concrete and Spray Urethane Foam. ExpandoThane also makes a great Polyurea membrane for foundation walls before backfilling with dirt. SET INCLUDES ONE 55 GALLON DRUM OF PART A, AND ONE 55 GALLON DRUM OF PART B. All Expandothane documentation, manuals and resources available HERE.